And there you have it! 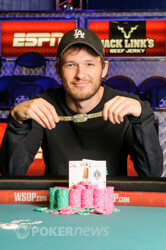 Joe Cassidy wins his first World Series of Poker gold bracelet after beating Scotty Nguyen in an epic heads up battle. This event started four days ago with 256 players all gunning for that little piece of poker history, and of course a $294,777 first place prize. Many greats came to play, and possibly the greatest came very close to winning his ninth bracelet. Phil Ivey couldn't close it out yesterday and found Nguyen and Cassidy battle heads up for the title today. And what a battle it was! Read all about Ivey's fight for number nine in yesterday's recap, as we started this fourth day with just two players. These were the chip counts going into the final day of play. Cassidy started off with a big lead and looked to close it out quickly, but Nguyen had other plans in mind. After just a couple of hands Nguyen got his stacks up to over a million and the first scoop of the day also went to the short stack. From the button Scotty Nguyen just limped, Joe Cassidy raised and Nguyen made the call. The flop came down , Cassidy bet and Nguyen called. The turn was the and this time Cassidy opted to check-raise when Nguyen put in a 100,000 chip bet. Nguyen called. The river was the and this time Cassidy check-called. Nguyen turned over for a straight and a low, and Cassidy got scooped. It didn't hurt Cassidy all that much, as he still had around 2.3 million chips left, and soon after he chipped Nguyen down to just 220,000 chips. It seemed to be over, but Nguyen had some fire left in him. After doubling up with against on a board Nguyen was back up to 690,000 chips and ready for more. The limits were massive and only 25 minutes later Nguyen had managed to add another million to his stack. Cassidy was clearly a bit frustrated, since he probably figured the bracelet was only a couple of hands away when Nguyen was super short. 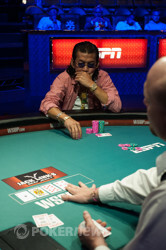 In the third level of heads up play Nguyen reached his high point at 1,710,000. From this point on it went uphill again for Cassidy who took Nguyen apart. A serious of small pots knocked Nguyen down to just a few big bets, and even a runner-runner double up couldn't keep him in the tournament for long. This is how the final hand went down. 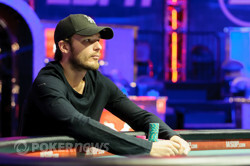 The flop came down giving Cassidy top pair to Nguyen's bottom pair with the same low draw. However, the hit the turn to give Nguyen a leading two pair. Cassidy picked up a broadway draw and got there when the hit the river to win the tournament. 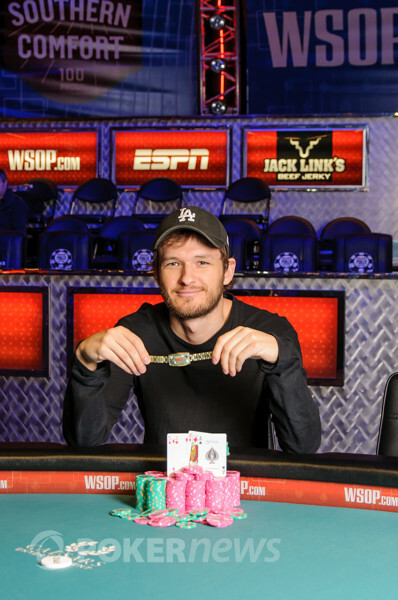 With this win Joe Cassidy collects his first ever gold bracelet and a $294,777 payday. Scotty Nguyen adds another amazing result to his long list of cashes, but his sixth bracelet will have to come some other time. Joe Cassidy is the new champion! Scotty Nguyen's valiant effort came up just short with a second-place finish. After the previous pot was chopped, Scotty Nguyen limped on the button. Joe Cassidy checked his option and the flop came down . "I scoop, Scotty," said Cassidy. Cassidy tabled for ace-ten high with an 8-5 low to scoop the pot. Scotty Nguyen called on the button and Joe Cassidy raised from the big blind. Nguyen called and the flop came down . Cassidy bet, Nguyen raised all in for 140,000 total, and Cassidy called. "Just a ten," said Cassidy. Nguyen was well ahead with the flopped flush and scooped the pot following the turn (which happaned to give Cassidy outs to a full house) and river. From the button Scotty Nguyen raised and Joe Cassidy called from the big blind. The flop came down and both players checked. The turn was the and it got checked once more. The river was the and Cassidy bet, Nguyen called. Cassidy showed and scooped the pot. On the next hand Cassidy raised the button and Nguyen called. The flop came down and Nguyen check-folded. Nguyen is down again to just 300,000 chips. From the button Joe Cassidy raised and Scotty Nguyen called from the big blind. The flop came down and after some raised Nguyen's final money went into the pot. The turn was the and the river the giving Nguyen both a low and a flush in order to scoop the pot. He's right back in it. Scotty Nguyen limped the button and Joe Cassidy checked his option in the big blind. The flop came down and Cassidy bet, Nguyen folded. From the button Scotty Nguyen raised and Joe Cassidy called. The flop came down and Cassidy check-called. The turn was the and the action got checked. The river was the and Cassidy bet, Nguyen folded. From the button Scotty Nguyen raised and Joe Cassidy defended his big blind. 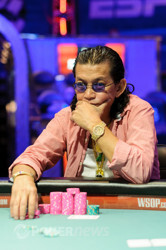 On a board Nguyen ended up calling a bet on every street, costing him a total of 400,000 chips. Cassidy turned over and he took down the whole pot. No Number Nine For Ivey?